No bottled water in refrigerator. 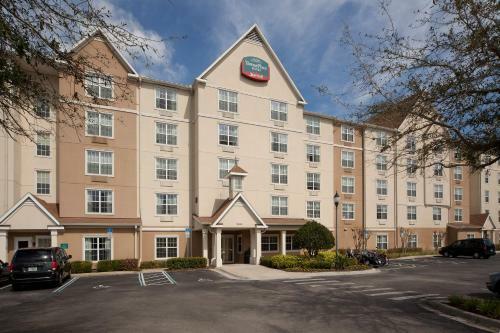 The 105-room pet-friendly TownePlace Suites by Marriott Orlando East at UCF is located in the Quadrangle Office Park, one third of a mile from the University of Central Florida and Central Florida Research Park. The five-story non-smoking hotel provides economically priced accommodation for both the leisure and business traveler. Items included with the room rate are high-speed Internet access, local telephone calls, parking and coffee available in the lobby 24/7. The hotel is within easy driving distance of three golf courses, numerous shopping malls and downtown Orlando. Other attractions and landmarks include the theme parks at Walt Disney World, Universal Studios and Sea World. All the suites have a fully equipped kitchen with a refrigerator with icemaker, conventional and microwave oven, dishwasher, stove, toaster and silverware and dishes. Other features are a work desk with high-speed Internet access, dual-line telephone with voicemail, cable television with news and movie channels, VCR player, pullout sofa bed, alarm clock, tea and coffee making facilities, iron and ironing board and a hairdryer. This inn has an outdoor heated pool, exercise room and is adjacent to a jogging trail. The property is within walking distance of several restaurants including Bennigans, Tony Romas and a Perkins Family Restaurant. The 24-hour front desk has a list of restaurants that will deliver to the hotel, safe deposit boxes and information on area events and attractions. Other amenities include a coin-operated laundry, fax and copy services, valet-dry cleaning, vending machines and a picnic area with a barbecue grill. 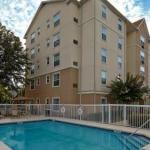 This is Orlandos first TownePlace Suites and it has proved to be a winner with a wide range of clients. Parents, checking on their student children at UCF, said it was a great place to stay. Families and executives both said the location was ideal and the prices reasonable for the quality of the accommodation. Many say they will stay here again on future visits and will recommend the property to family and friends. By the time they return there may well be another TownePlace Suites in the area.